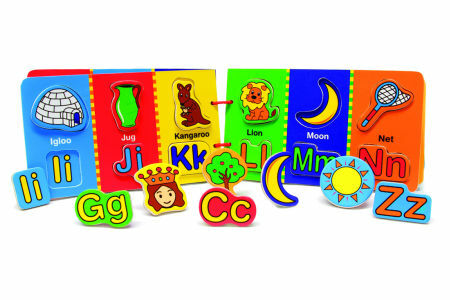 Magnetic Wooden Alphabet Book is a nine page wooden book with removable letters and pictures from A to Z. Each letter is depicted in lower and upper case and has a picture to illustrate it. The pages are made from plywood and have a hidden magnetic layer. Each letter and picture fits into a recessed slot. This book is very solid and beautifully colourful with clear simple images. The pages are held together with thick red cord. Size: Each page is 20cm x 12cm. All the pages together make a book 5 cm high. Material: Wood, Sheet magnets, Cotton cord. We like this because: "A great way to learn the alphabet.."